Electronic health record adoption—and HIT in general—recently received a big boost with the passage of the American Recovery and Reinvestment Act, otherwise known as the economic stimulus bill. But will it be enough of an impetus to overcome the obstacles that have thus far kept many healthcare organizations from implementing HIT? The enactment of the American Recovery and Reinvestment Act includes an estimated net investment of $19 billion for HIT, according to Janet M. Marchibroda, CEO of the eHealth Initiative and soon-to-be chief healthcare officer at IBM. That includes $2 billion in immediate, discretionary funding for the Office of the National Coordinator, an estimated $29 billion to be paid out through Medicare and Medicaid incentives, and estimated off-setting savings of $12 billion. In addition, other aspects of the bill are allocated to assist telemedicine and other types of HIT, notes Marchibroda. “For example, $85 million is provided to the Indian Health Service for health IT; $1.5 million is targeted to community health centers, some of which can be used for health IT; and up to $40 million of the total of $500 million of the Social Security Administration can be used for health IT,” she says. As for the vast majority of the HIT funding set to support Medicare and Medicaid incentives, Johnson says the monies will be allocated according to a specific formula. He explains that for Medicare, the payments will start in 2011 and will go to either hospitals or individual physicians that qualify according to several criteria, some of which have yet to be defined. “But, essentially, within the law or through the rule-making process, the secretary will define what qualifies a hospital for what the bill calls ‘meaningful use.’ And that is up for debate. It is probably a test that will evolve over time, but we do know that it will include the ability to submit quality data and report to HHS [Health and Human Services] on certain quality metrics that haven’t been identified yet,” he says. 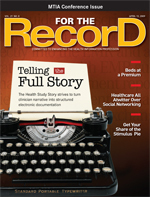 While Marchibroda admits there are currently only broad guidelines to define the so-called meaningful use of EHR technology, she says, “To qualify for the incentives, one must use a qualified EHR that includes patient demographic and clinical health information such as medical history and problem lists and has the capacity to do such things as provide clinical decision support; support physician order entry; capture and query information relevant to healthcare quality; and exchange electronic health information with and integrate such information from other sources.” Further, the qualified EHR must meet certain standards established by the secretary of HHS, which are expected to be published by the end of 2009. While the Medicare incentive payments reward those facilities using certified EHRs, Johnson says some early adopters may be out of luck in regard to Medicaid incentive payments. “In Medicaid, they’re intending to reward physicians for the purchase and use of EHRs. If you’re a physician today and you already have an EHR that happens to be a certified product by the end of this year, you don’t get the reward for the purchase of the EHR. You do get paid some amount of money to maintain that system, but you don’t get the bigger payment that would compensate you for the purchase of the system,” he says, adding that the purchase of a software license tends to be the single biggest check a physician would cut for an EHR, in the range of $21,000 per physician. In terms of grant-funded loan programs, Marchibroda says the stimulus bill “provides some language regarding what the funds will be used for and who will qualify for such funding,” but that information regarding detailed requirements for grant programs are still to come from either the Office of the National Coordinator or another federal agency, such as the Agency for Healthcare Research and Quality. “For example, certain funds are designated for states or state-designated entities to cover a whole range of areas, including enhancing participation in health information exchange, identifying state or local resources, providing technical assistance, supporting medically underserved communities, and supporting use by patients, clinicians, and public health,” she says, noting that optional grant funding also exists for loan programs that would support the purchase and usage of certified EHR technology and the exchange of health information and also provide training support. Marchibroda believes many HIT companies are prepared to meet the expected increase in demand and sees their biggest challenge in adapting to standards, implementation specifications, and certification criteria that are yet to be announced by HHS. “The biggest challenge for vendors will be to align with the standards that are ultimately adopted, through a process that is likely to be fairly fast paced. The act does say that the standards processes that will be put in place could draw upon work conducted to date but does not require this. So the standards component related to all of this is the big unknown,” she says. While healthcare organizations have the most challenges to overcome regarding EHR implementation, Marchibroda believes the stimulus plan takes a reasonable, incremental approach toward adoption. “By December 31, the secretary [of HHS] will have adopted a first set of standards through a rule-making process. I expect that funds related to ‘getting ready,’ including funds to support technical assistance—both nationally and locally—and planning, will go out in late 2009 or early 2010. I imagine implementation grants and potentially loan funds (for the development of infrastructure and EHR purchase and adoption) will not go out until after the standards are formally adopted. Finally, the incentives for healthcare professionals and hospitals begin in 2011, after funds have been released for both planning and purchase,” she explains. For healthcare organizations wary of where to start, Johnson advises against rushing any technology implementation. “As a consultant, I would not advise anyone to hurry up their implementation efforts, especially on the inpatient side,” he says. “For a hospital to rush through this type of thing would be potentially disastrous because not only would you get the technical implementation wrong but you would anger a lot of your clinical staff because it represents such a disruption to the way they normally work that that change has to be managed carefully and slowly. “One of the nice things about the bill is that it does give people a two-year head start, essentially, to say if you haven’t already started, you can start now and you’ve got two years at a minimum to finish this project before you have to worry about missing out on payments,” he adds.